My heartfelt apologies to all who love to write and visit this site. Let me set aside excuses: life traumas, experiences of the dull mind, the attraction of pouting, and all the usual reasons for not writing. Ugh. It gets tiresome, and we ALL have been there. The struggle continues. I’m here, not at my best surely, but still kicking. Learning does not fade. I CAN, and I need to DO. I hope to post more challenges for you, but only when I’m sure they are worthy of the many stellar writers you have shown up online in past. I wish I could mention you all by name. My imagination conjures all of you. The widow, Althea, put her false teeth in a glass of Mosel wine, wondering if the alcohol might burn off the yellow stains. Althea refused to use Polident, preferring to eschew all symbols of old age. Except the wig (horrible hair was her inheritance from her late father’s side), which she stubbornly wore in shades of hot pink champagne. At 86 she no longer cared what people thought, in fact, she enjoyed the whispered comments–it was her way of socializing. Most times she sat at her first floor bedroom window, in her favorite comfy chair, covered with her white chennelle throw, waiting to see if any animals emerged from the woods that edged her lot. She tossed leftovers up close to the woods, but while the raccoons, squirrels, and birds liked most of it, none of them would eat her lasagna. It sat there, rejected, refused, and rotting. Hopeless. The momma wolf took pity on Althea, knowing the many ways the old were stuck coping with the crummy outlook of their last days. The momma wolf had recently been shoved aside by a younger female plus that pink wig in the window was rather intriguing. Momma took a dainty bite of old lasagna and gagged. She walked up to Althea’s window and shook her head. Althea toasted the wolf with a glass of white wine, wondering if she invite the wolf in. Althea opened the window and set out a bowl of wine for the wolf. Momma moved closer and took a sniff. Fruit? She lapped up the whole bowl, giggled, ran in a circle, and burped. Althea put her pink wig on the momma’s head and poured more wine for both. Quick note: My novel, The Old Powers, is available on Amazon in Kindle or paperback format. 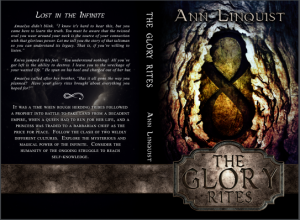 The Old Powers is the prequel to Rites of Glory, so if you’re curious about the histories of the characters, it will fill out your understanding. The good guys are flawed as well. Aren’t we all? Stanley Berpsmog spent a lot of time in his room to escape his mean older sister, seven year old Bertha. Not that his room was all that interesting. She had already broken all his toys she could get her hands on. He lay on his stomach on his bottom sheet, having kicked all of the rest of his bedding to the floor. Now he threw his pillow on the floor too. He would have liked to punch someone. But hmmm. His bottom sheet had an interesting hole in it about the size of red grape. He stuck his finger in the hole. It was warm. No, it was hot!